The number of poor people, especially children, in Cleveland and surrounding areas is on the rise, according to statistics from the U.S. Census Bureau. Poverty in Cleveland grew from 34 percent in 2010 to 39 percent in 2014. 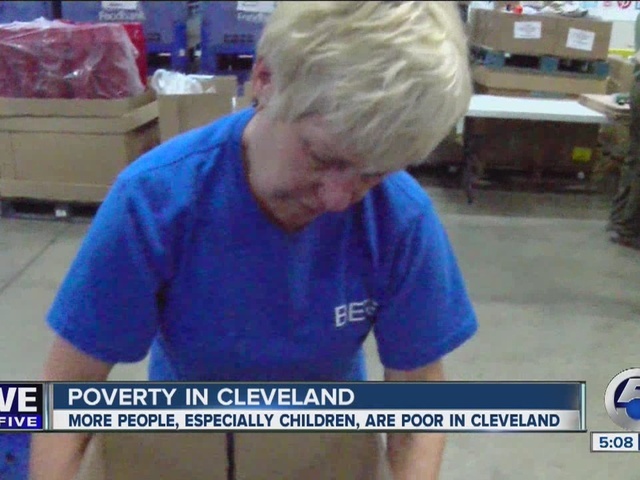 Child poverty in Cleveland increased to 58 percent last year, up from 52 percent in 2010. The Greater Cleveland Food Bank is seeing the demand for food grow too. They are relying largely on donations and volunteers to help people in need. "Northeast Ohio has been slower to recover than the rest of the nation," Karen Pozna of the Food Bank said. "What we've been seeing is that a lot of jobs that have come back are lower to mid-wage jobs, and people are living paycheck to paycheck." "Every time I pack vegetables that someone else would throw out, I know someone in the community can use those," Betsy Buxton said, a Food Bank volunteer from Olmsted Falls.